White hot anger danced across my mind at the sight of a horde of illegal alien invaders crossing the U.S. southern border, between April 27th and April 29th, as several climbed the border fence holding the Honduran flag, reminiscent of so many other incidents at the border when so-called “immigrants” waved Mexican and Guatemalan flags. This was an anger, a patriotic resentment, intensified by the sight of Pueblo Sin Fronteras [People Without Borders], a communist front group, alongside U.S. and foreign media and U.S. lawyers and advocates, such as Heather Crone of ‘Show Up for Racial Justice’, who were paving the way for their crossing, as though these illegal aliens were entitled to enter America and the Americans themselves had no choice or say in the matter — a white hot anger that demands such “immigrants” be banned from America until Hell itself freezes over. Most patriotic Americans feel the same flush of resentment, and that resentment is not softened by the sight of Mexican immigrants flying Mexican flags all across the nation at anti-President Trump and pro-illegal alien protests, especially when many Americans realize that there are many other nationalities, including Muslim majority countries, crossing with the Central American illegals. Neither does it help to ease that frustration once one understands that 800 different languages are now spoken in New York City and over a hundred are spoken in Los Angeles, and even though the United States spends billions of dollars on English classes for immigrant children, our country is reduced to pressing “1” for Spanish, “2” for English and “3” for Arabic. These immigrants started out marching from the Honduran – Guatemala border in March and they trekked straight through Mexico, some two thousand at one point, to the U.S. border, primarily with approximately 1200 Hondurans, Guatemalans and Mexicans, along with a few other nationalities, where they sought to enter or actually crossed as “refugees” seeking asylum. The asylum ploy was well drilled into them by U.S. lawyers prior to them setting out on this journey, chanting and waving Honduran flags the entire way. Despite their longing for a better life and wanting to escape the civil strife of Honduras and the wars of Nicaragua, El Salvador and Guatemala, now fleeing organized crime and the gang violence of the infamous “northern triangle” region, it is hard not to fault them for not staying and fighting, with everything in themselves, in order to save their own countries. Americans did so during our War for Independence, because, for most of them, they had already fled intolerable situations, and America was the last stop. And what of those legal immigrants now residing here in America, who paid out many thousands of dollars on application, legal and expediting fees — what does this say to them? Couldn’t these immigrants claim “refugee status” and protection in the first safe country they reach, meaning Mexico? They could, as noted by Secretary of Homeland Defense Kirstjen Nielsen. If Mexico feels no obligation to welcome these refugees, why should this obligation fall to America and Her people? Attorney General Jeff Sessions called this caravan ” a deliberate attempt to undermine our laws and overwhelm our system”. And he was right. Rather than waving the American flag out of reverence and respect for our country, the one they want to call their new home, these “immigrants”, who had yet to file the first scrap of paperwork starting the process, were waving every flag except the American flag — the flags of hellholes they supposedly wish to escape. These are not “refugees”; they are invaders. This caravan was never about asylum or refugees, at least not for People Without Borders. It was a concerted and well funded effort to advance the Communist globalist agenda of breaking down sovereign borders, especially in America. One may have noticed that these penniless refugees had glossy new Honduran flags and pre-printed signs. They are funded by the leftist, fascist billionaire George Soros, who seeks to erode America’s sovereignty and demonize Her. Sessions later went on to direct U.S attorneys to prosecute every illegal entry that they could. This directive came not only in response to the caravan arrival, but it was also a response to the recent DHS report that documented a 203 percent increase in illegal border crossings, between March 2017 and March 2018; the report also revealed the single largest month-to-month increase since 2011, noting a thirty-seven percent increase between February and March of 2018. But America can’t seem to get a break. If its not Democrat leftists in Nashville protesting the Tennessee State Legislature’s proposed HB-2315 that prevents sanctuary cities from forming in the state, ever in pursuit of the illegal alien vote, its Speaker Paul Ryan proposing an amnesty bill for DACA in the House, that pleases forty Big Business first Republican legislators, as they also move to block President Trump’s agenda regarding border security, the visa lottery and chain migration. In the former, the Democrats allege that HB-2315 is a mass deportation bill, and although it is not, it should be. 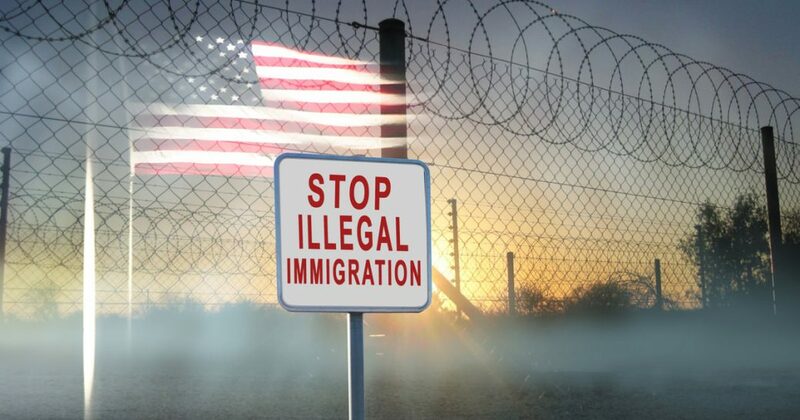 Let that white-hot anger loose on Congress and state legislators, America, as the 2018 election approaches, and demand a mass deportation operation to remove some 35 million illegal aliens from our country, and force Congress to stop allowing 500,000 to a million illegal aliens annually to jump our borders. Use your white-hot anger to force Congress to put Americans above all refugees and place thirteen million American children living in poverty at the top of their list, along with five million unemployed and a million homeless Americans: Deport every illegal alien in the country now — round them up — and don’t allow anymore, not one more, of these illegal aliens to barge into America, as if they have any right, a right that does not exist.